India has always been a land of grandeur and mystery. Its art reflects the history, the conquerors, and the many religions of the continent. 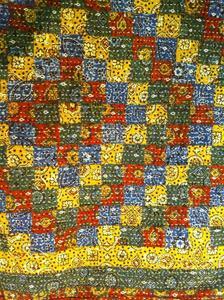 Indian quilts have long been prized for their beautiful patterns and colors. Our Ralli quilt selection celebrates the tradition of hand-making quilts In India and the surrounding countries that may stretch back thousands of years. The traditional uses for an Indian quilt included bed sheets, a cloth for eating, and as a carrier for small goods. Today, these Indian quilts are viewed as works of art. Unlike many newer ralli quilt manufacturers who are mass producing quilts, our collection is handmade by artists working in the traditional fashion. Indian artwork & jewelry is also much sought-after by collectors for its unique charm. We offer both antique and contemporary jewelry from India, with precious and semi-precious gemstones that make excellent additions to your art collection or jewelry box. Whether you’re looking for jewelry or an Indian quilt, Spectrum Art Gallery LLC has the Indian artwork you seek.